How about berries instead of Botox, tomatoes instead of day cream, carrots instead of make-up? Many foods are beauty aids that make expensive creams and treatments unnecessary. Their effects are not immediate, though. 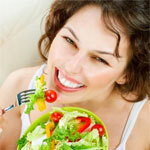 "Foods aren't medications that work overnight," noted Hans Lauber, a nutrition expert and author from Munich. Rather than a short-term impact, many foods have a preventative and, above all, lasting effect, he said. "This means it's never too late to start holding back the skin's ageing a bit and ensuring a glowing complexion," remarked Michaela Axt-Gadermann, a dermatologist and professor of health promotion at Germany's Coburg University of Applied Sciences and Arts. Skin ageing has a lot to do with subdermal inflammation and can be resisted with the right natural products, she said. "Meat, sausage or other animal foods are wrinkle accelerators because they contain arachidonic acid, which is also formed in our body when we eat foods containing omega-6 fatty acids such as margarine and sunflower oil," Axt-Gadermann explained. The same, she said, goes for free radicals, a type of unstable molecule that multiplies as a result of improper nutrition, sunlight and smoking - and attacks the body's cells. But there are dietary counterweights: "Berries have a strong protective effect against free radicals; that is, they've got a lot of antioxidants," said Lauber, referring to substances that interact with and stabilise free radicals. "And the rule is, the darker, the better." According to Axt-Gadermann, a glass of elderberry juice has the protective potential of 14 glasses of red grape juice and 55 glasses of apple juice. A small amount of sour berries also covers a person's daily requirement of vitamin C, which improves the elasticity of the skin and promotes digestion. Spinach, too, has an enormous protective effect, Lauber said, 100 grams of it packing the protective punch of 240 grams of rucola or 1,900 grams of cucumbers. Broccoli is also a highly beneficial food, he said, with an almost medicinal effect like many other green vegetables, which - thanks to their high vitamin-B content - alleviate minor inflammations and thus make for a fresh complexion and healthy skin. And Lauber swears by the beauty aid beloved of fashion models, namely green tea. The carotenoids in tomatoes and carrots not only delay skin ageing but also protect against the sun, Axt-Gadermann noted. "Most people forget that they're exposed to the sun every day and don't put on sunscreen," she said, adding that regular consumption of tomato and carrot products provided a sun protection factor of 4. What is more, eating carrots results in a fresh-looking complexion. A healthy diet also includes carbohydrates and fats, "both of which our body needs," said Harald Seitz, a home economist and nutritionist for the consumer information service "aid" in Germany. He pointed out that whole grain products contain carbohydrates and are, like fruit and vegetables, rich in dietary fibre. "They promote regular digestion, which is also a prerequisite for beautiful skin," Seitz said. In addition, he recommended eating omega-3 fatty acids, which are found in walnut oil and rapeseed oil. Proteins have anti-ageing qualities and can also repair minor skin damage, according to Seitz. "Our skin is made up of collagen, which is formed from building blocks of protein," he explained. Collagen is needed for the formation and replacement of body cells. Seitz said that ideal foods in this regard were sour milk products such as yogurt, whey and buttermilk, which provided plenty of protein but were low in calories.